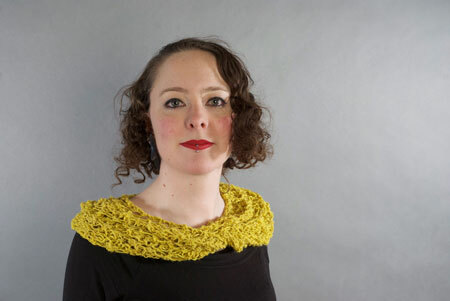 This frothy lace Möbius cowl is aptly named after Minerva, the Roman Goddess of wisdom, crafts, medicine and doctors. She could also be the goddess of p/hop. The Minerva Cowl pattern has been designed and donated to p/hop by the generous and talented Anna Richardson aka @onehandknits. 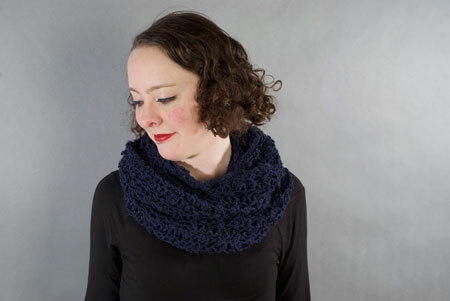 The pattern is based on a two stitch repeat which makes it easy to add or subtract circumference to the scarf, to give two or even three wraps around your neck. Yarn quantities are given for one and two wrap versions. An optional scalloped edging is given for those who want an extra challenge. Originally knit in a thick-thin Tussah silk, equivalent to a 4ply yarn this pattern can also be adapted to make a denser, warmer winter scarf by using a DK or Aran weight yarn on the same needles, just match the yardage requirements (approx. 435yds/400m per wrap). Knit in the round on circular needles from a Möbius cast-on this pattern includes full written instructions and charts (depending on your preference). The pattern is suitable for a moderately experienced knitter and requires less than one day to knit! 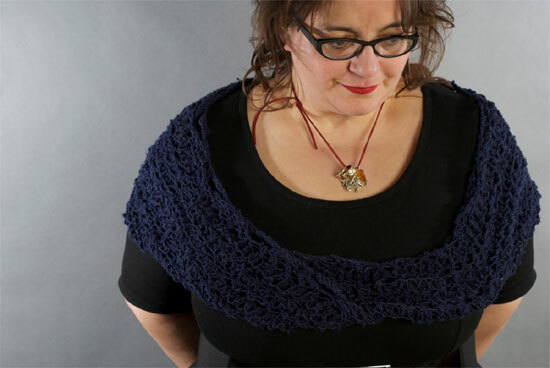 The Möbius cast-on is an entertaining technique which creates a Möbius loop in your knitting and allows you to knit both edges at once – you’ll be amazed. To see what others have made from this pattern, please visit the Minerva Cowl pattern page on Ravelry.